Cortana is a digital assistant on your Windows 10 operating system. 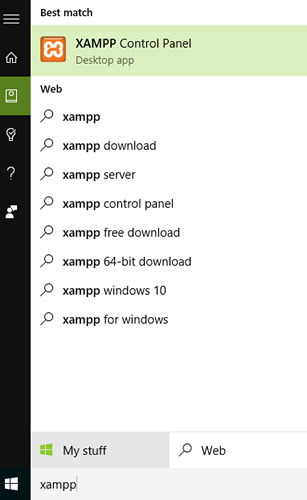 If you have already installed Windows 10 or used a Windows 8.1 phone you already know what Cortana can do. Cortana was first introduced at the Microsoft BUILD conference in April 2014. Cortana is available on Windows Phone, Windows 10, XBox, Android and iOS. 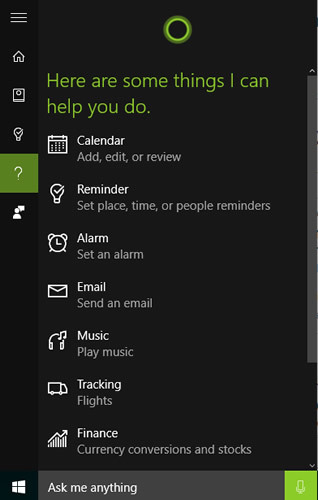 Cortana can do lot of things on your system from searching files to setting reminders, alarms, email. flight tracking and more. You can ask Cortana what it can do and it will answer with number of tips it ca do. Type or say “What you can do?” and see the response. For the first time you have to setup Cortana so that she knows what to do more effectively. You have turn on a setting to respond Cortana for Hey Cortana voice command. Using this command you can set a reminder open an app or ask a question. Enter your name in About Me section so that Cortana knows how to call you. Since it is a digital assistant and cloud based it is better that you fill information like your favorites, the more you add, the more accuracy you can expect from Cortana. The settings and other information will also get populated to your other devices through your Microsoft account. 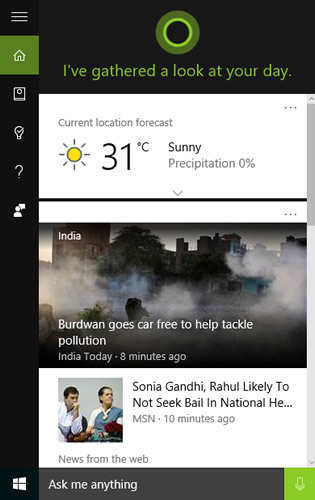 Cortana replaces the previous Bing Search app and Bing Smart Search feathers are incorporated into Cortana, it handles all kind of searches, it not only brings your programs but also it searches your OneDrive and the web for relevant results using the Bing search engine. If you want to see all the files stored in your system related to your search you should click on the “My Stuff” button at the bottom of the search pane. 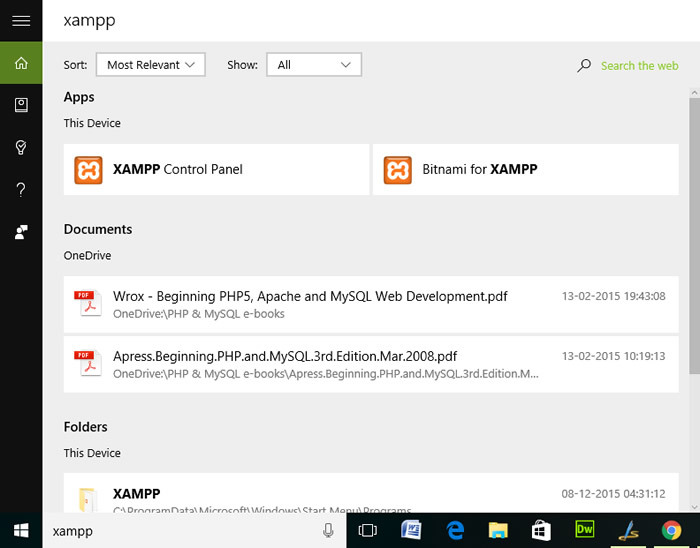 This will bring files and folders related to the search, you could also see what is stored in OneDrive using Cortana. Cortana has a natural language processing capability that means you can ask some generic questions like Find documents about.. will get you the documents. Another important feature of Cortana is setting up reminders. You can use voice commands to set reminders, with its natural language processing engine it will be able to set reminders if you just say Remind me to call mom. You can also set alarms using commands like set alarm tomorrow at 6 or wake me up tomorrow at 6. Other features includes tracking stocks in Finance section, if you are into stocks you can add your favorite stocks for Cortana to track and show you relevant information. Movies & TV section is for movie addicts, it can show your show times, trailers of movies you might be interested in etc, all this information is gathered from your online activities like searches you made on Bing etc. Cortana brings a music recognition service part of the Bing Audio earlier, it can recognize songs and saves your music search history in the notebook. If you want to know the tune that is playing you can ask Cortana, it will listen to the song and tell you the answer. You can also ask Cortana to play music and it will obey. After setting up Cortana will show cards for the day, these include, weather, events, reminders and news etc depending on what you have selected and given. Cortana will improve over time depending on your usage as it learns from your searches and other things you do on your system. Since it is liked to your Microsoft account Cortana will work seamlessly on your devices and syncs across devices. 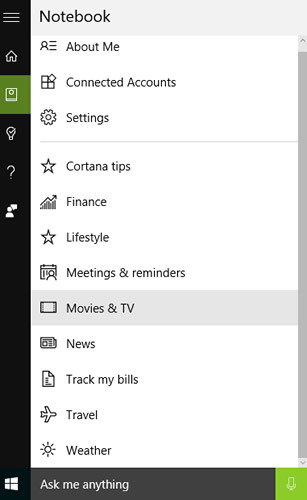 To see what Cortana can do just click on the “?” icon and it will show you what all it can do.